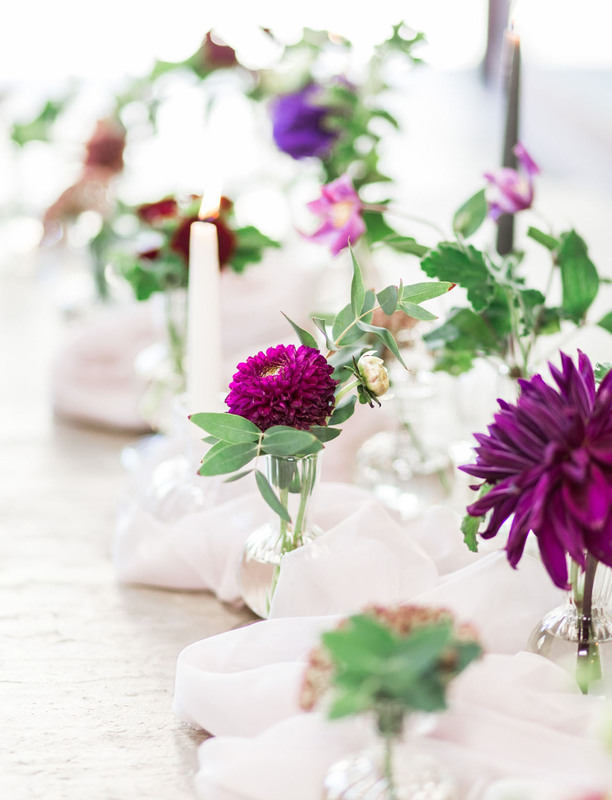 Did you see Part One of our ‘Wedding Planning Tips: Budgeting for Centerpieces‘? 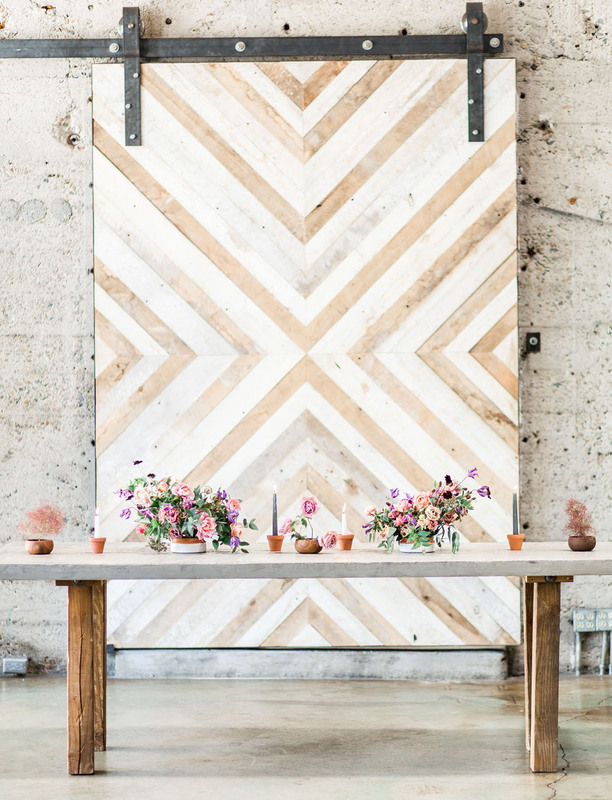 If so, you’ll know how helpful it was for figuring out the budget for florals + what to expect! 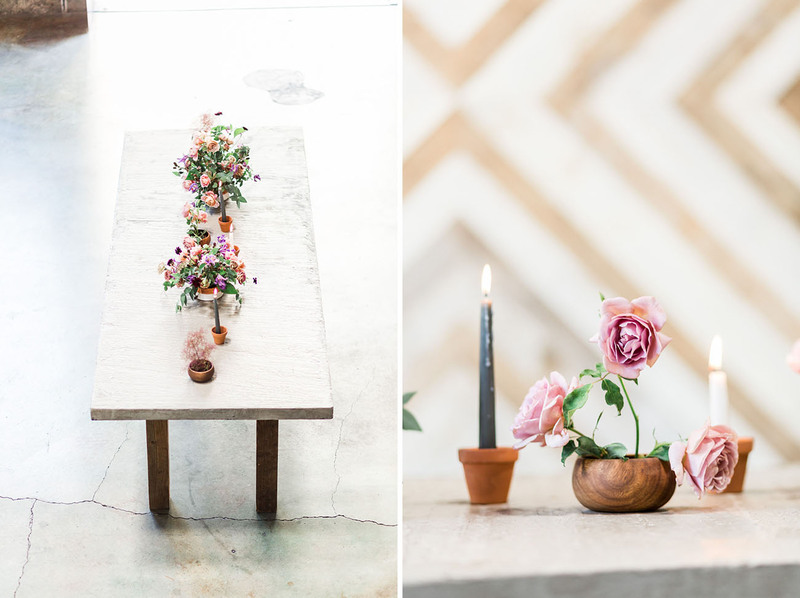 Well, Compass Floral is back again with all the info you need to decorate your tablescape — including vases + florals — and how to budget wisely! 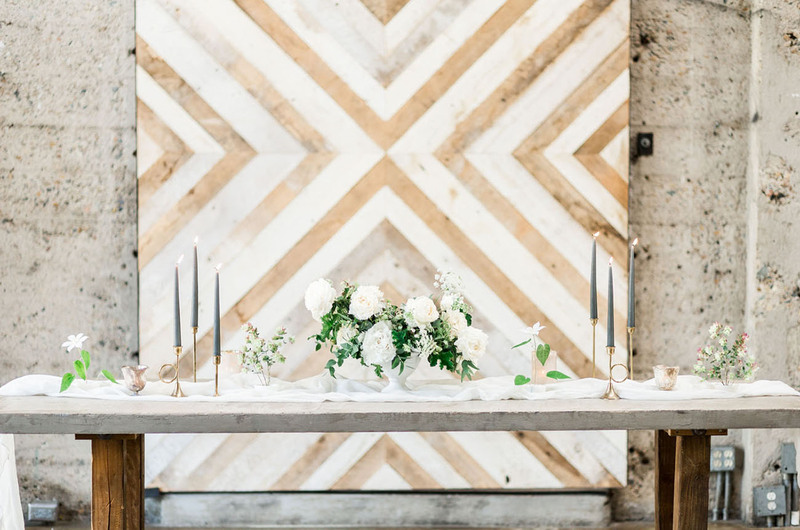 Taya of Compass Floral shares When designing your wedding it is always recommended to consult with your wedding florist so that they can have input on the overall aesthetic of your tablescapes. 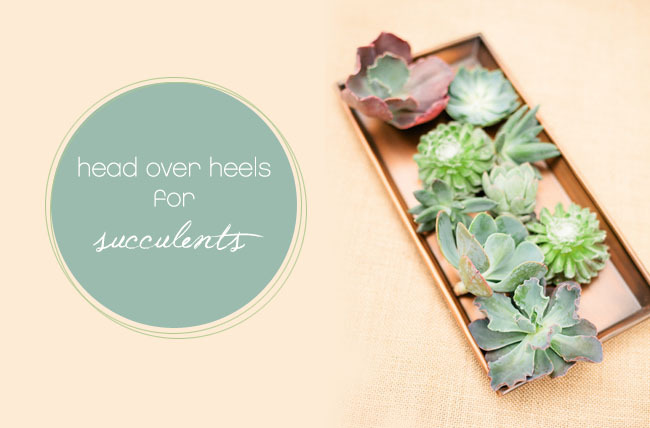 Besides florals, your wedding florist can provide an assortment of décor items for you. This includes votives, taper candles, fruit, table runners & decorative bowls. 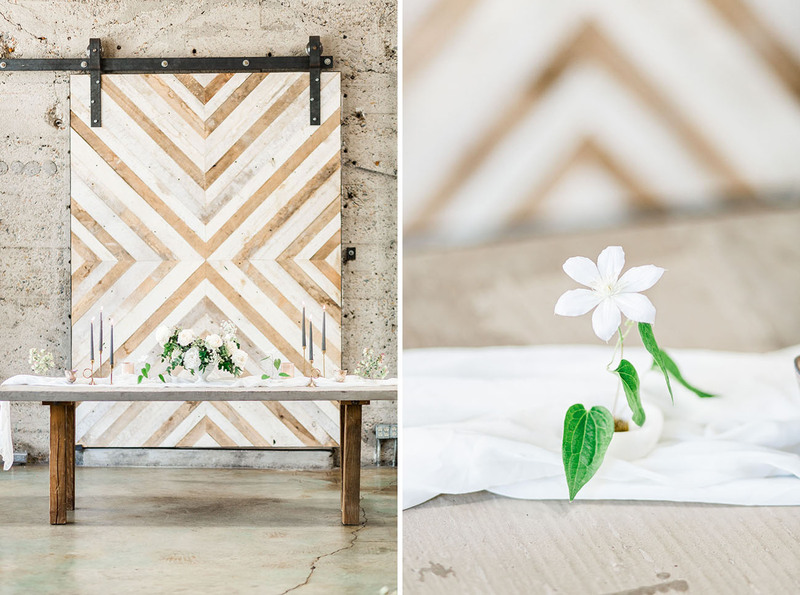 For this styled shoot at Luce Loft in San Diego, my photographer friend, Cavin Elizabeth Photography, and I thought it would be helpful to design three different tablescapes to give you an idea of elements that are involved along with florals to create a cohesive tablescape. 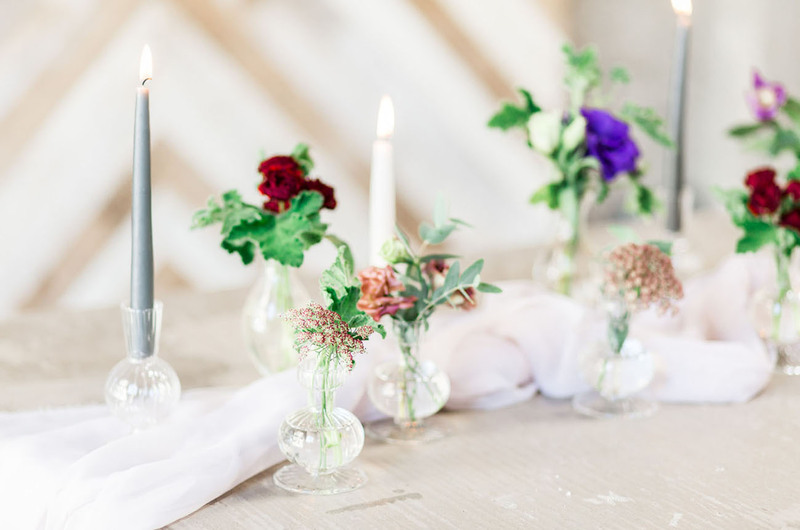 The first tablescape is a runner of bud vases & taper candles that are tucked into a fluffy mauve chiffon runner. Textured tabletop runners such as this range from $60-$90. They run only the length of the table, although you can order them to be floor length as well. The florals in the bud vases are chocolate lace, spray roses, lisianthus, clematis & dahlias with accompanying geranium & eucalyptus foliage. The taper candles were placed in the same bud vases as the florals to maintain a consistent look across the table. A tablescape such as this one, not including runner, costs about $200. Such a pretty spread of florals + all the vases make the greenery and pops span across the table — which in turn, is less expensive than a long completely floral runner. 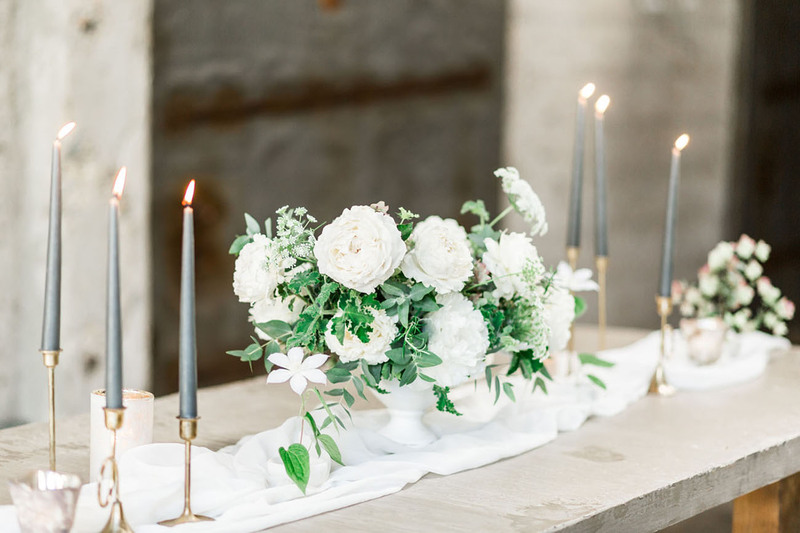 The second tablescape is a single centerpiece with tall taper candles in brass candlesticks, low votives and satellite arrangements in marble bowls set atop an ivory chiffon table runner. 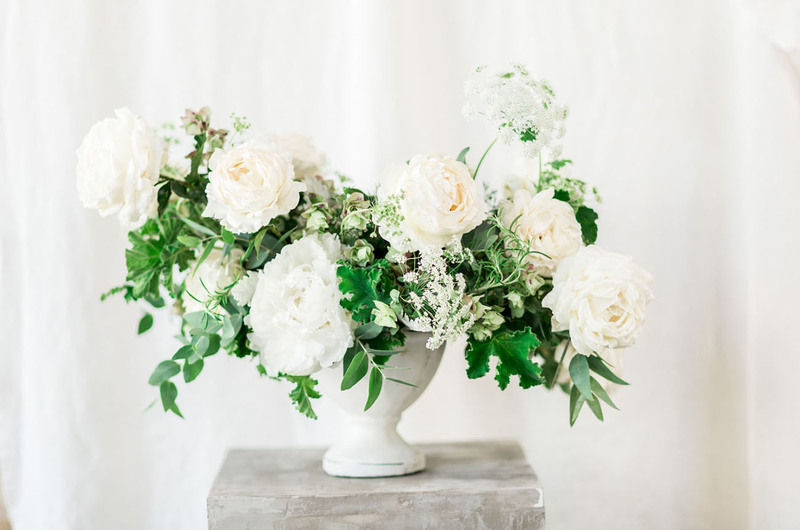 The focal centerpiece is simple & classic with a mix of peonies, Classic Woman roses from Ella Rose Farm, Queen Anne’s Lace, oregano & minimal foliage varieties. Marble bowls were used for the satellite arrangements that held single stems of white clematis and petite clusters of oregano. 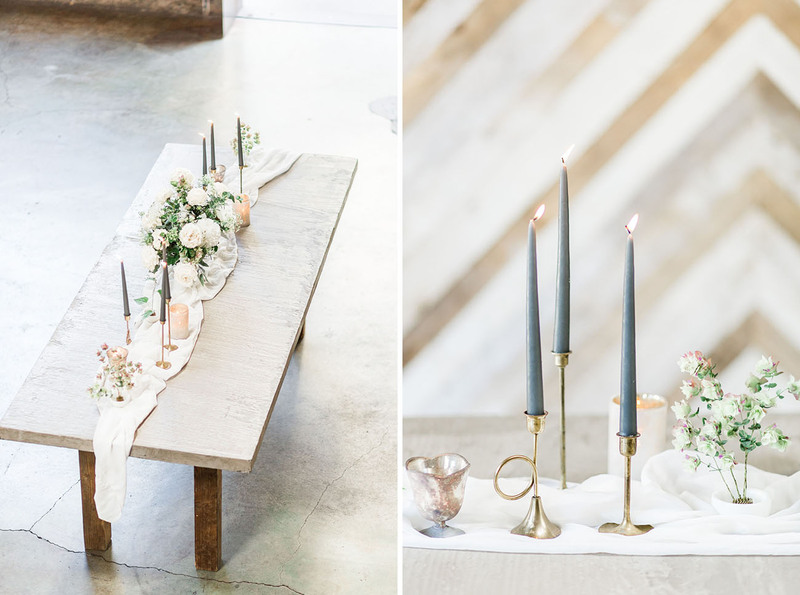 An elegant + simple tablescape like this one (not including the runner) costs about $300. For longer tables and to spread the focal point, you might want to try two centerpieces instead of one. 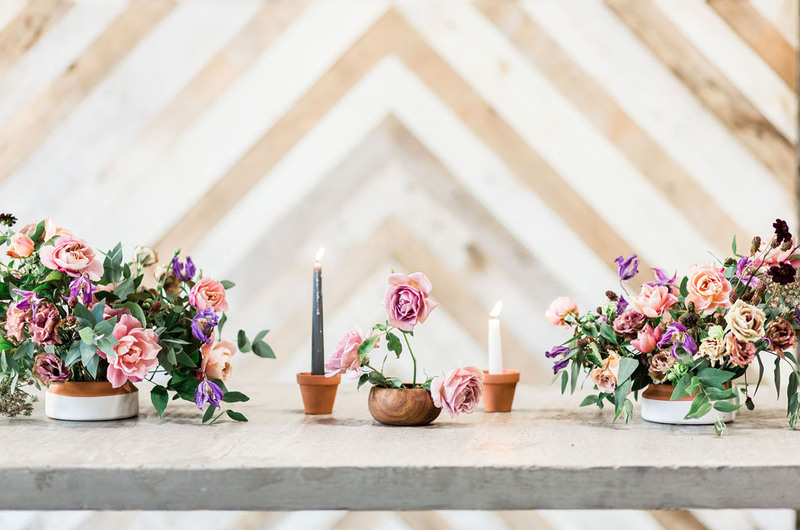 The third tablescape has two centerpieces with a mix of tall & low taper taper candles in mini terracotta pots and satellite arrangements in acacia wood bowls. 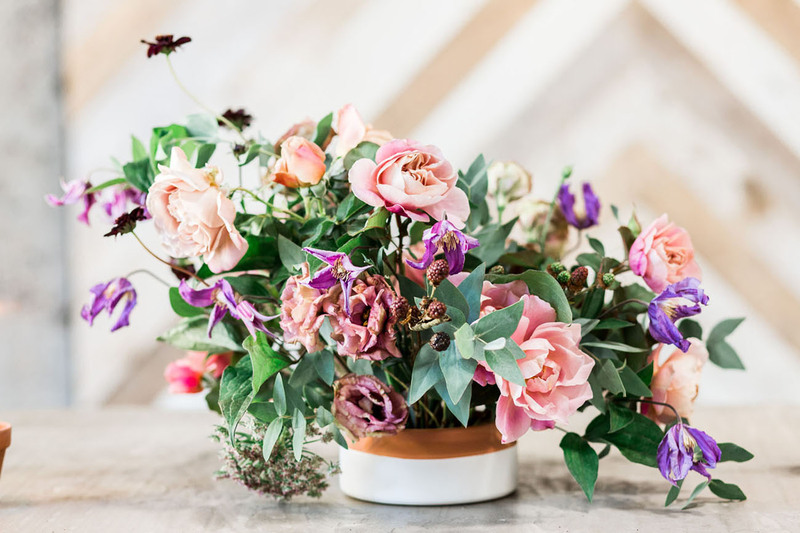 The centerpieces have more floral variety with a mix of koko loko & distant drum roses from Ella Rose Farm, purple clematis, brown lisianthus, chocolate lace, chocolate cosmos, blackberries, & eucalyptus foliage. The satellite arrangements in the acacia wood bowls held single stems of smoke bush and a center cluster of distant drum roses. A tablescape like this one costs about $400. 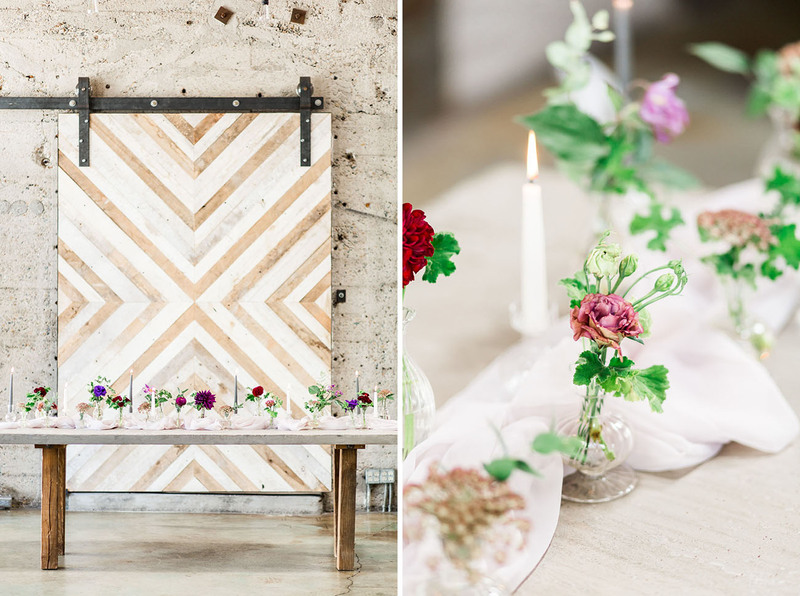 We hope that gives you a better insight into florals + sparks your imagination! 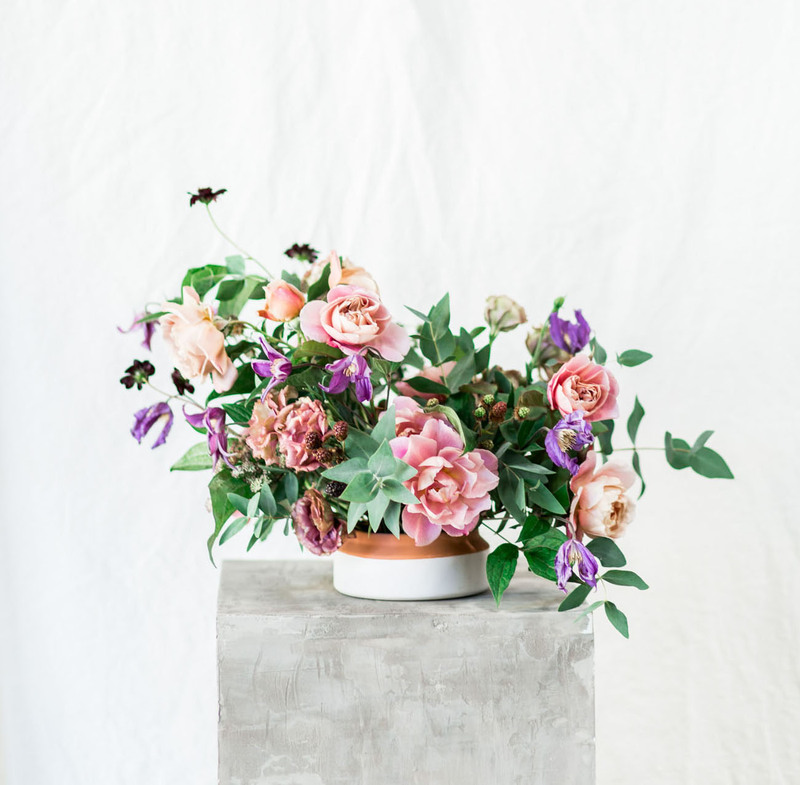 We’d love to see your creations + floral visions — share them in the comments below! 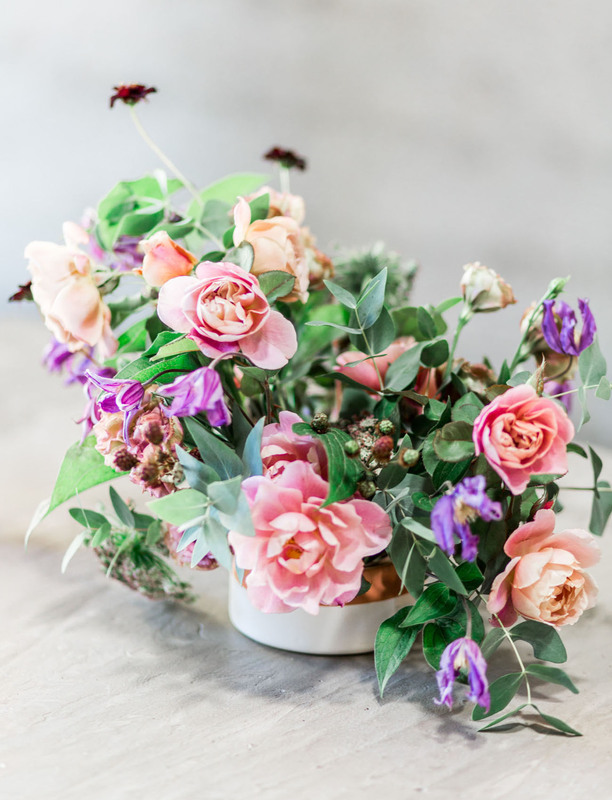 A huge thank you to Compass Floral and Cavin Elizabeth Photography for sharing these helpful tips!! Such an inspiration! And useful tips! Thank you! Love this! 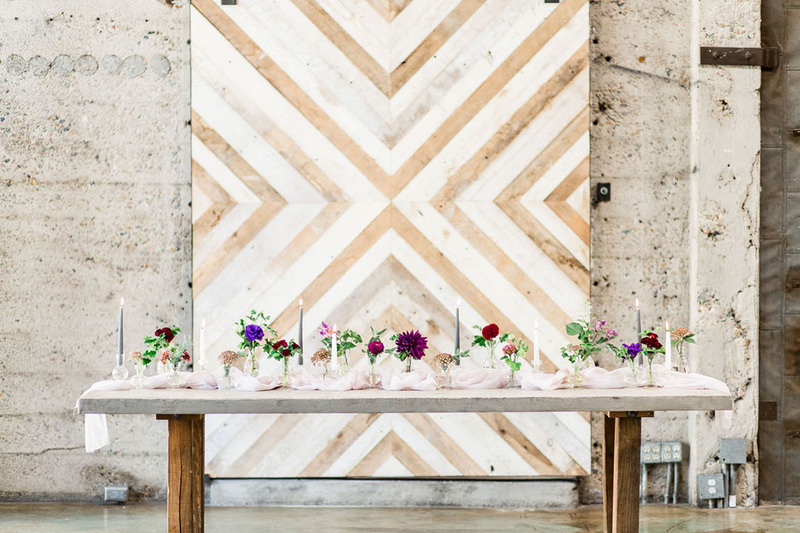 Great tips and ideas for planning your florals!